Looking for an objective review of the BMW 3 Series Gran Turismo Hatchback? OSV has got you covered, from engines to lease deals. The new BMW 3 Series Gran Turismo Hatchback is big, comfy and performs like a stallion. What’s not to like for families who want road presence to go with usability? The name itself is a bit exotic. However, BMW hasn’t messed around with this one and it pretty much is what it says on the tin: A large hatchback that comes with lots of space. Leg and headroom is good up front and in the back, 40:20:40 split-folding rear seats are standard across the range, and the car handles as well as you expect a BMW to handle. OSV takes a closer look at what it’s all about with our 2017 BMW 3 Series Gran Turismo Hatchback review. The GT model drives very much like the 3 Series Saloon from which it’s derived. The steering is direct, the suspension setup does a good job of absorbing lumps and bumps in our worst road surfaces, but there is mrs body lean than you get in the saloon variant. This car weighs more than the saloon, but don’t let that scare you as it really does handle well. For best results, add the £750 Adaptive M Sport suspension, as this reduces body lean but doesn’t worsen overall comfort. In terms of the engines, none of them are slouches. The 318d GT is the slowest, and takes 9.3 seconds to get you from a standstill to 62mph. That’s pretty good for such a big car. The 320d GT model is much quicker, though, and covers the same distance in 7.8 seconds, but the 330d GT model steals the show with a 0-62 time of 5.7 seconds. However, that’s still nothing compared to the four-wheel-drive 335d GT model, which can thrust you from a standstill to 62mph in 4.9 seconds. There are also petrol engines to choose from. However, as impressive as both the 320i and 330i are, they don’t make a lot of sense for a car like this. They don’t sound as sporty as any of us would like, and they’re not even as fast as the diesel models. Worse still, they cost more to run. If you are die-hard petrol head, though, the six-cylinder 340i GT is the one we’d recommend. It sounds sporty, and can propel the car from a standstill to 62mph in just over 5.0 seconds. It’s light, nimble and benefits from a rear-wheel-drive system. The saloon is comfortable, but this GT is even more comfy. The suspension is softer, though you’d have to stick to the standard smaller alloys for better cushioning. Adaptive dampers are only available as an optional extra, but they’re well worth adding as they enhance the luxury-feel of this car. The dash is near identical to the one in the saloon. It’s made from top-quality plastics, and gets upmarket trim finishes that suit the cars’ character. A colour screen sits on the mount, and you use this to control the stereo, the sat nav and pretty much everything else. Brand new for this 2017 revision, meanwhile, are glossy materials and more chrome detailing. One of this cars biggest selling points is its practicality. If it wasn’t so practical, you’d probably just buy the 3 Series saloon. Thanks to a 520-litre boot, it’s one of the most useful large cars around right now, and can even boast more luggage space than the 3 Series Touring Estate. It’s such a usable boot, too; its boot lid is massive, and the boot itself is power-operated. The rear seats are super easy to fold, and when you do fold them you can increase total capacity to 1,600-litres. There is even more space in seating area. The saloon might be bigger than ever, but it can’t compete with the GT for passenger space. Rear legroom is excellent, and three adults will be comfortable in the back. However, headroom will be compromised if you add the panoramic sunroof. The car is as strong as a bull to, and has a max towing weight of 1,800kg. Standard kit is good across the range. The base-level model gets air conditioning, 18” alloys, active cruise control, automatic windscreen wipers and lights, rear parking sensors and an electrically-powered tail gate. Move up to the Sport models and you get treated to a racier body, a racier multifunction steering wheel, and sports seats. Luxury models throw in a full leather interior, chrome detailing on the outside, while the M Sport is generally more stylish than the other models. 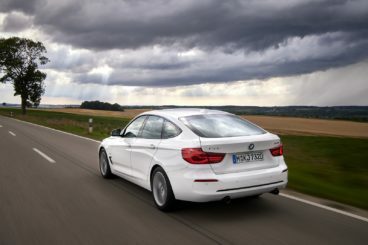 The 3 Series saloon was awarded 5/5 for its EuroNCAP crash test, and although it’s doubtful that this GT will be tested, we reckon it would have achieved the same score. For maximum security, we recommend adding the Active Security Package. It will set you back an extra £995, and comes with a blind-spot warning system and driver assistance. Prices for the new car start out from £30,400 and rise to £43,400. For more information on our leasing deals, check out our page here. In terms of its running costs, the fact that the GT shares its engines the saloon can only mean good things. 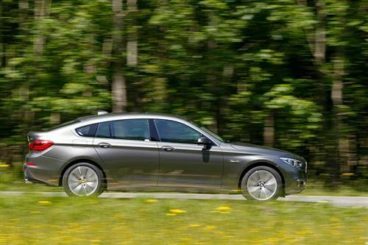 The 320d diesel model is the most popular with buyers, and it’s easy to see why – it offers good performance, and can achieve returns of 60.1mpg. Its annual road tax bill, meanwhile, is just £110. Impressive. If costs are your priority more than anything else, we recommend the 318d model. It also breaks through the 60mpg barrier, but doesn’t offer as much performance as the 320d. We reckon most buyers will be prepared to pay slightly more for the 320d. The 320i and 330’s costs are helped by the addition of turbochargers. The former can achieve fuel economy returns of 45.6mpg, while the latter is good for 47.9mpg and has slightly more power. This is the roomiest 3 Series around, which is good news for you and your family. Ride quality is very good, and five people should be comfortable enough even on longer journeys. Any family will be happy with the running costs. The petrols benefit from turbochargers, and despite producing more than 240bhp, the 330i can boost fuel economy returns of almost 48mpg. We appreciate that it isn’t the worst-looking BMW around (that particularly ignominious award goes to the 5 Series GT) but it doesn’t look appealing from certain angles. Let’s see how the car fares against its rivals in the comparison section of our 2017 BMW 3 Series Gran Turismo Hatchback review. 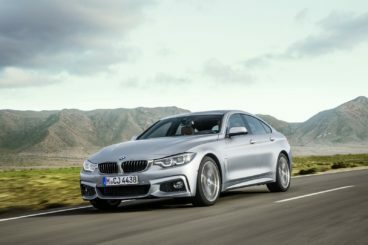 The new BMW 4 Series Gran Coupe is stylish like a coupe, desirable like a BMW, and practical like a Ford hatchback. It’s a winning blend. BMW’s are well-known for being fun to drive, but the GC is a bit of an exception to the rule. It’s more of a comfortable cruiser than a sporty coupe. All the engines have lots of power, though, beginning with an entry-level 2.0-litre turbo diesel that powers the 418d. However, our preference is the 430i petrol model. It’s quick and do 0-62 in just 5 seconds, and feels quiet and smooth most of the time. Enthusiasts will probably be keener on the 440i petrol model. It’s got 326bhp, and generally feels a lot sportier than the rest of the range. 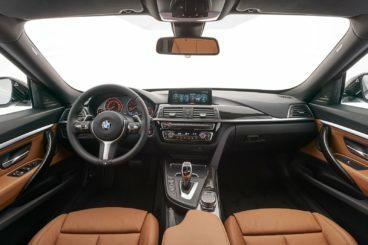 The steering is unsurprisingly not all that entertaining for a BMW, but this just reflects the fact that, although the GC is derived from a coupe, it’s more of a practical, family-oriented coupe. The diesels are naturally the engines to go for if you want to keep running costs down. The 418d is the cheapest to run, and can achieve very impressive average fuel economy returns of 65.7mpg. The 420d model, however, is actually more powerful and cheaper to run, and can average fuel economy returns of 67.3mpg. To give you an idea of what the petrols are like, the 420i model is good for 48.7mpg. Not bad. BMW have marketed this car as a sports coupe, but as well as driving like a comfortable cruiser, it also looks much more like a comfortable cruiser inside. The ride quality is refined and smooth, the seats offer lots of support and comfort, and accessing the rear is a lot easier than in the standard coupe. The roof has been raised by 12mm, which has improved headroom. Legroom is also good, with our only criticism being that the middle seat is a bit redundant unless you’ve got a child who can sit there. BMW says the car is a 4+1, and they’re right. The boot, meanwhile, measures 480-litres, which puts it on par with the A5 Sportback. 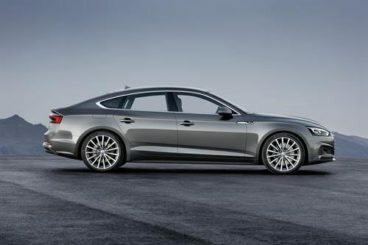 The new Audi A5 Sportback combines badge appeal with family-friendly hatchback appeal to good effect. There’s more to love about the way the A5 drives than there is the 4 Series GC we just looked at. This car is fast, agile, but – importantly – it’s also quiet. The only fault is the artificial steering. Apart from that, it’s a joy to drive. For an Audi, it’s also surprisingly comfortable! The most popular engine in the range is a 2.0-litre 187bhp diesel engine that’s reasonably economical and relatively quick. It can get you and your family from a rest to 62mph in just under 8.0 seconds, and has enough pulling power to make overtaking a cinch. The 2.0-litre 249bhp is an Audi stalwart, but this petrol engine is unlikely to find many takers in this class. It’s more expensive to buy than the diesel we just looked at, but we like its pace and smooth delivery. However, its running costs are generally off-putting with buyers. While the diesel can return an eye-catching 70mpg, the 2.0-litre petrol is good for 47.8mpg. The A5 Sportback’s interior is stunning. The materials used are top quality, the infotainment system is intuitive an easy to operate, while the minimalist dashboard is clutter free. You can also get your hands on Audi’s brilliant Virtual Cockpit system if you’re willing to pay extra. It’s well worth it, as it makes it so much easier to control the dash and the things you see. Practically speaking, the car fares well. There is plenty of space up front and in the back, although it’s disappointing that a sloping roofline means rear passenger head room is limited. Moreover, the rear is further compromised by Audi’s desire to make this accommodate as much of your luggage as possible, while the hatchback configuration also doesn’t help. The boot measures 480-litres, and when you fold the rear seats, you get a totally flat load area. However, the load lip is quite high. Family-friendly running costs, plenty of comfort and even more space are the order of the day here. It’s also practical too, and takes many of its more useful cues from the tried and tested 5 Series GT. The cabin is roomy, and the boot is huge. Green-minded buyers will be pleased to know that it’s now better for the environment, too. The addition of turbochargers have helped with efficiency, and when you throw in strong performance the new BMW 3 Series Gran Turismo feels like the perfect hatchback.